Training for all swimmers - from beginner to professional, pool and open water. Friendly, enjoyable and effective sessions. See your freestyle from 4 different angles above & below water. Your stroke is analysed with you on poolside and the whole session recorded on DVD for you to take home. Full 70 mins quality Swim Smooth training in 6 lane pool. Consistent, effective work on freestyle technique, fitness & openwater skills in a friendly, informal setting with a top coach! Full day's coaching for small groups including video analysis, theory, drills, pool work. By arrangement and tailored to your needs. Location is flexible. Seamus is proud to be one of fewer than 20 certified Swim Smooth coaches in the UK, enabling him to make his livelihood from his lifelong passion - swimming, especially open water. He is founder of Felixstowe Swimscapes, an Ice Miler and channel relay swimmer. ASA and STA Level 2 qualified, Seamus has been involved in swimming all his life, teaching and coaching since 2010. He runs two great squads and video analysis sessions in his hometown, Felixstowe, right on the North Sea coast of Suffolk. He continues to develop as both swimmer and coach, while his innovative, inclusive approach and positivity inspire others to do the same! Nov 21, 2018 Return of the hundred hundreds! Sep 22, 2018 Make your breakthrough! Limited period VIDEO ANALYSIS offer! May 19, 2018 First Clinic at Felixstowe! May 2, 2018 Swim Smooth-athon! Apr 16, 2018 Spring feedback! Apr 2, 2018 Easter teamwork! Mar 3, 2018 Swim Smooth bring a whole lotta swimming to Tri Show London! Feb 19, 2018 First Swim Smooth clinic for me...and Cambridge! Feb 6, 2018 Video analysis brings 20 sec/100m improvement within a week! Jan 12, 2018 A hundred hundreds - no problem! Dec 12, 2017 Just the 60 x 100m today! Nov 8, 2017 Swimming in 50m pool - a rare event in the UK! Sep 24, 2017 Video analysis key to Eileen excelling in iconic open water swim. Sep 20, 2017 Perfect River-to-River at record speed! Sep 8, 2017 Video analysis no. 100! Aug 28, 2017 Big swim with the Icicles! 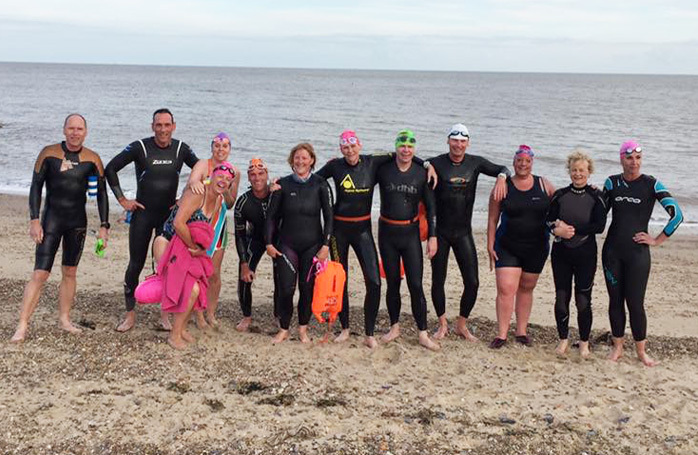 "Swim Smooth Suffolk has been a fantastic way to improve my swimming both in the pool and open water. A great mixture of drills and sets and with every session being different it keeps it challenging and exciting! Everyone in the squad is so friendly and encouraging - there is real team spirit. First class teaching and the perfect start to any keen swimmer's weekend!" "I did the Blenheim triathlon in 2015 and clocked 14:57 for the open water 750m swim. In 2017 I completed the same swim in 12:07! Then I returned for the Great East Swim 2 miles. Last year's time was 1 hour 4 mins - but this year I was shocked go NINE minutes quicker, 55:02. The only chance I get to swim is in your sessions once a week, occasionally twice a week. So I'm delighted to make these tremendous gains. And I only started swimming in your sessions just over a year ago! Clearly you know what you are talking about! "I LOVE the Saturday morning Swim Smooth Suffolk squad. It is really helping me to improve my fitness, learn open water skills for my upcoming Great East Swim and work on my freestyle technique. Having had a video analysis session with Seamus this has further given me the knowledge of specifically what I need to do to improve my stroke."